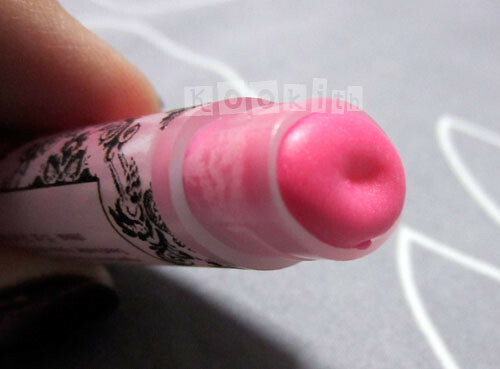 A tinted lip balm from the Kiss You Off: Color Rich Lip Balm range. Kiss You Off: Color Rich Lip Balms have all the color and pigmentation of a lipstick, varying from sheer to completely opaque, but are made with skin-loving moisturizing ingredients. Susan, the owner, has launched a new website and shop, and the Sugar Rush lip balm listed there has been reformulated to be more pigmented than my swatches. “WHY IS MY LIP BALM BRIGHT PINK? !” was my initial reaction when I saw the colour of Sugar Rush in its tube. When I put it on however, I was relieved. 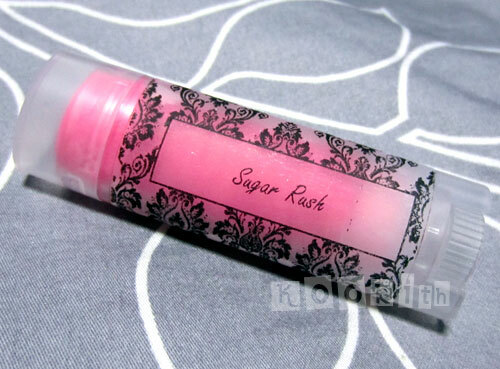 Sugar Rush is a warm-toned, sheer baby pink lip balm with fine gold shimmer. My pre-reformulated (I made that word up :P) lip balm is so sheer, it barely shows up on my lips. Believe me when I say it took many coats to get the swatch to look like this. 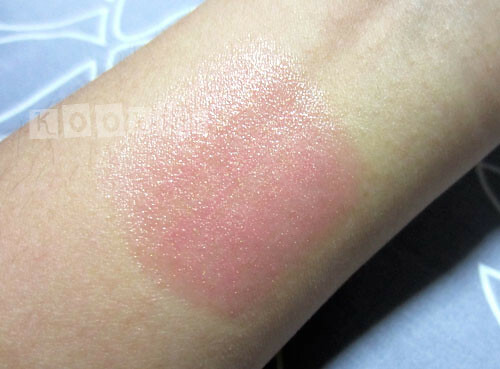 Based on the swatches on the DG website, it looks like the pink in the new Sugar Rush would be just a tad more visible. I think I would like the reformulated version, as I prefer my tinted lip balms to be sheer yet give a hint of colour at the same time. I love that the gold shimmer in the lip balm is extremely fine and doesn’t stay behind on the lips. There is nothing I hate more than finding huge chunks of sparkly stuff stuck on my lips after a meal. The gold shift really complements warm tones and I find that it helps to polish up my look. This is a great everyday colour, and it is perfect for ladies who do not like wearing a lot of make up. I put it on whenever I need to go downstairs to buy food or run some quick errands. It just adds that extra little something and makes me feel less sloppy in my t-shirt, shorts and flip-flops. 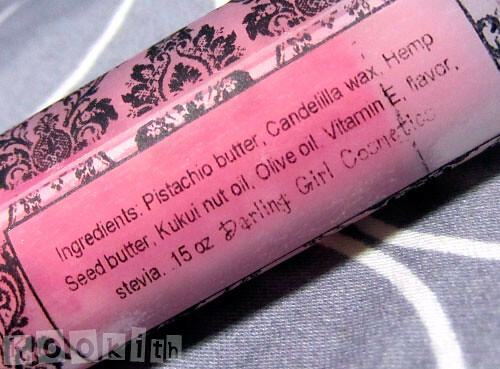 The texture is quite waxy, and I have to glide it over my lips a few times to coat them. I honestly do not know if the lip balm is long-lasting, because I keep licking it off my lips! I know the website states that it is bubblegum flavoured, but it smells and tastes like burnt sugar to me. Absolutely delicious! I do find that I cannot use this for many days in a row, as it causes the edges of my lips to become really dry, like they’re about to peel. I have never had this problem before and I have no allergies that I know of. I’m not sure what causes it, but I’m not too worried as the lip balm has been reformulated, and the ingredients seem to be slightly different. I adore the see-through packaging, the vintage label and the oval tube is just too cute. However, I do prefer slim tubes as my lips aren’t thick, so I tend to end up with lip balm on the skin around my lips (might explain the dry ring around my mouth). I’m happy to read that the reformulated lip balms will be packaged in slim tubes instead. I know, I know. What is the point of doing a review of a product that has already been reformulated? Well, I only realised it after I’d already done most of the work, so I didn’t want the blog entry to go to waste! 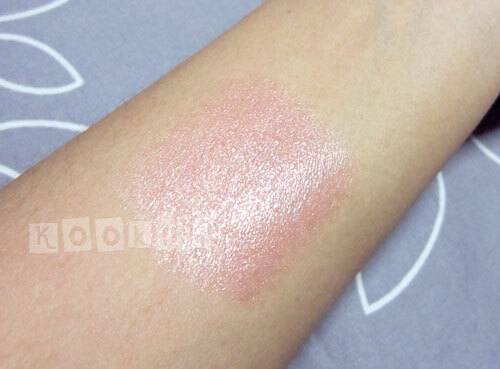 😛 No doubt the reformulated version will be more pigmented than what you see in my swatches, but I do think that the new Sugar Rush will still be sheer – just perfect for me.